A brand refresh that embodies the grace, beauty and attention to detail of the dance form that is ballet— with a modern twist. Ballet Theatre of Maryland (BTM) is both a dance company and ballet school based in the heart of Annapolis, Maryland. While their breath-taking shows have made them a household name, their somewhat underwhelming brand was unable to accomplish the same feat. Cue Eleven Peppers Studios. EPS sat down and got really comfortable with BTM. We chatted about their three main goals for the brand, who their audience was and what information was most important to them. After countless hours of information sharing and research we came to one conclusion — BTM was already living and breathing the exquisite brand they desired, they just needed a designer to visualize it and put it down on paper. In other words, they just needed a costume change and EPS had to make it work. Ballet is a dance form that personifies beauty, precision and grace. When looking at BTM’s national competitors we picked up on a trend — clean typography with little to no illustrations. 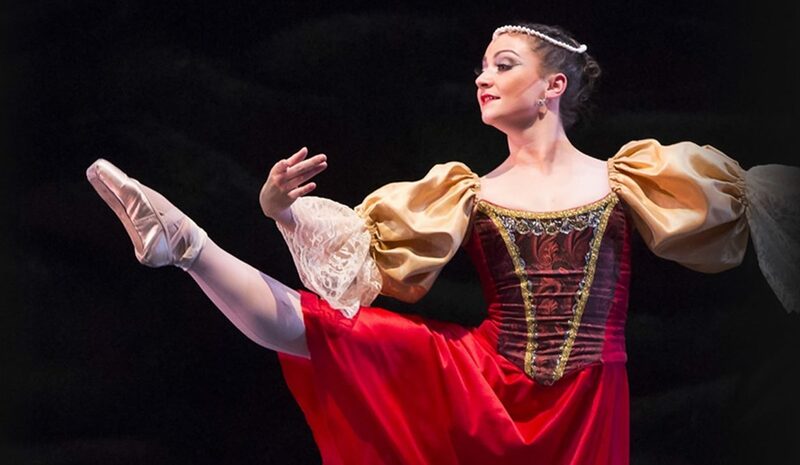 These distinctions mimic the clean lines and strong yet fluid refinement that is ballet. These elements became the foundation of a new mark that would instantly associate BTM with ballet’s “cool-kids” club while maintaining their own unique, simple elegance. Since the new mark’s backbone would stem from common attributes found within the ballet industry, we knew we had to differentiate BTM’s brand with color. With meticulous care and delicate execution EPS chose to incorporate the existing bold red into a highly adaptable array of tones, suitable for all mediums. The combination of BTM’s signature red paired with a polished serif typeface was just the balance needed to stand out amongst the crowd of competitors. The bold, yet sophisticated mark seamlessly represents both the achievements of the dance company and the credibility of the school. Once the logo was deemed a success, we turned our sights to the BTM website. 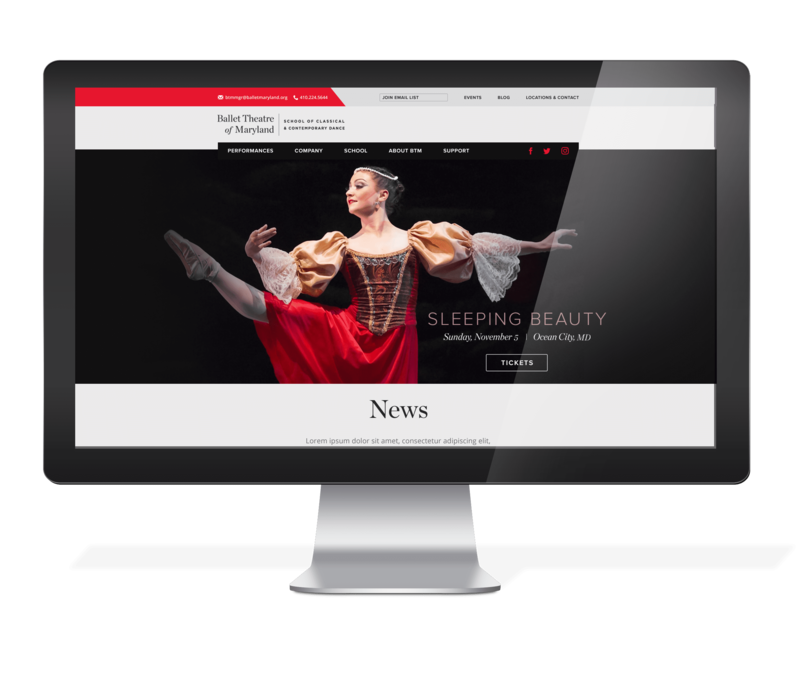 EPS knew that a multifunctional website with only the most streamlined user experience design was essential for achieving their goals — recruiting top-tier talent for their dance company, growing enrollment for the school and increasing ticket sales. When EPS began digging into the existing website one thing became abundantly clear. Simple tasks such as learning about BTM or purchasing tickets for upcoming shows were made tedious by a complicated and heavy data hierarchy. Most users were spending way too much time maneuvering through layers and layers of information before getting to what they wanted. 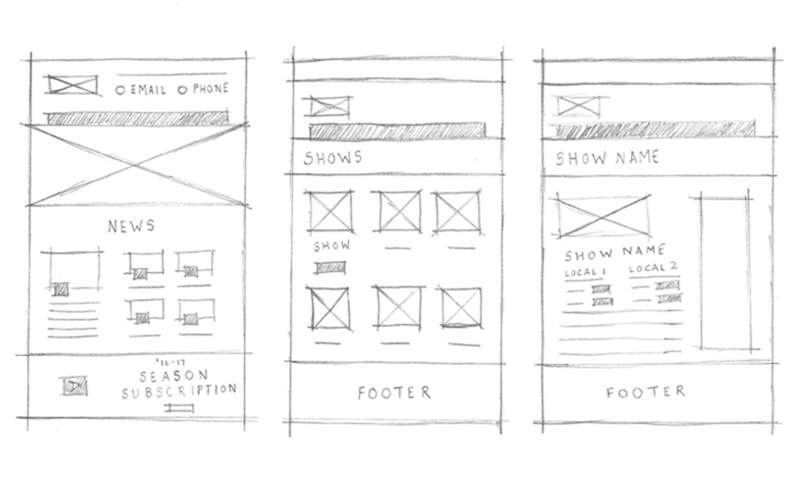 To eliminate the burden, EPS developed wireframes that ensured users would be able to quickly find what they were looking without all the unnecessary “clicking around.” We incorporated stronger call to actions, simplified the graphics and paid specific attention to the all-important contact information and social media buttons. 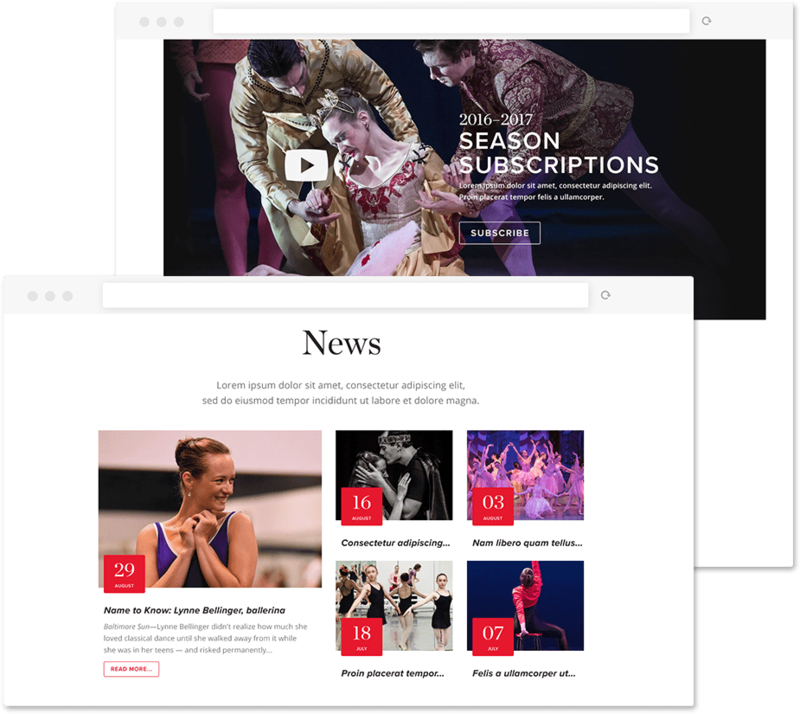 Several revisions later, the new site utilizes dual navigation that allows users to flow effortlessly from a homepage this is rich with visual cues to more content driven pages such as upcoming performances. Regardless of a user’s preferred route, the new design puts BTM center stage. 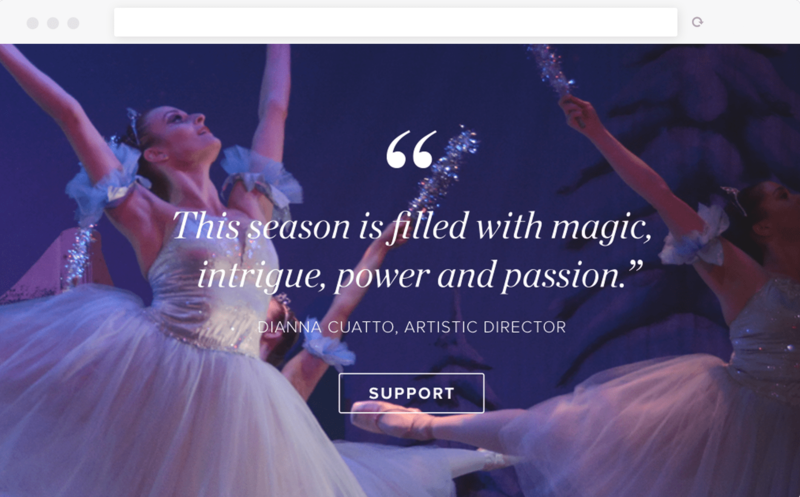 Kristen and her team at Eleven Peppers worked with the Ballet Theatre of Maryland on our website marketing. The proposal was thorough and professional as was their presentation. The work itself was clean, and aesthetically-right on the mark! I highly recommend them.